Yes, it is the birth of a new year. A new era. A new Darlene. I made 0.0 resolutions this year. They don’t work for me. Resolutions are my way of cementing failure. I never fail at failure. This year I have goals. Small attainable goals that I will achieve. I call it a 2012 Bucket List. I checked one off the list today. I went skiing for the first time ever today. I skied down a small hill today several times and I only fell once. *NOTE* standing up in skis is very difficult. So try your best not to fall – all you newbies out there. When I walked in the boots I felt like my shins were going to be severed in half. But I smiled and laughed as I walked around the grounds of Blue Mountain Ski Lodge with seven-year olds that were pointing and laughing. I know they were. My crew abandoned me after lunch. They were ready to hit the actual slopes. I was not ready. I almost said screw it and went to the “real slopes” despite my fear. But that fear was real and I could taste it. The instructor smelled it and called me on it. 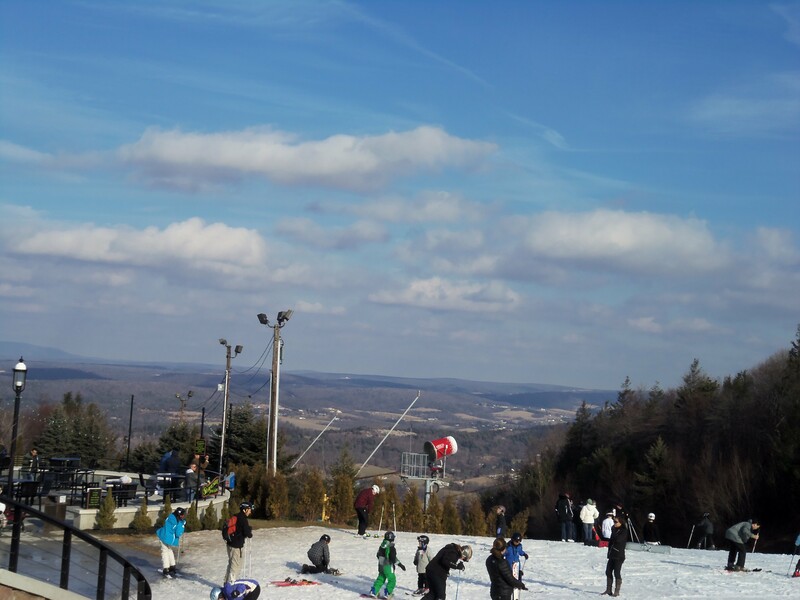 So.. after lunch the crew went to the slopes and I headed back to the “learning slope” to get a few more lessons in. There were too many kids. When I was on the hill earlier I almost smashed into some kid standing at the bottom of the hill. So when I was back at the hill this time around, panic set in. My anxiety swept over me like a broom over a dust bunny. I actually stood at the bottom of the hill like a tool staring at all the kids and parents skiing down the hill. No one noticed me standing there. But I noticed me standing there. I picked my skis up, walked over to the lockers and sat in the corner by the light pole people watching. I looked down and saw a tiny, black spider and smiled. I like spiders. He seemed to be in a big unfamiliar world, too. I smiled at him, said my hellos and continued to watch all the kiddies and their parents ski and snowboard. So I reflected on my day and my ROW80 goals as I sat there with my new eight legged friend. I did ski for over an hour, so I checked that off of my list. True, I did not glide gracefully down the mountain. I wanted to. I wanted to love skiing. I am going to go back. I do not give up. For the first round of ROW 80 I am keeping it simple. Tax season is here so that means fewer hours in my day. But that is okay because less hours means more money. Edit first draft of NaNoWriMo novel. 2 – 3 posts a week on blogs. That’s it for now! Happy New Year everyone. Looking forward to getting to know new ROWers and catching up with familiar faces. I loved your first time skiing story (my husband has been trying to inspire me to try for years, and like you I’d like to). I’m sorry to hear it wasn’t as you’d hoped, but the spider moment sounds like you did just the right amount for yourself at the time. Good luck on the ROW. Love that you tried skiing, love that you will try again. Thank you. 🙂 And thanks so much for wandering over. Hope your 2012 is most excellent. Yeap. I found that out hard way the basic difference between skiing and cycling. With skiing it’s easy to get going the tough part is to stay up and even tougher is to stop without falling. Good luck with your Bucket list! I hope you trying skiing again, once you get over the learning curve it’s really fun! Hi Sharon. I am hoping it is a good sign as well. 🙂 I wish you the best on your ROW80 road. This is gonna be a great ROW80 year. You sound like me with my horse riding! I’ve only done it twice but I’m determined to get the hang of it. I haven’t fallen off yet but I still cling on for dear life. But we’re getting there. As my husband always says, at least I’m trying! Yay! I am so happy that you are persevering with the horseback riding. 🙂 Good job! “I never fail at failure.” Hmm. This means you’re a success at failure. Do you know what that means? That means you actually fail at being a failure because you’re successful. See, there’s hope 🙂 Congrats on attempting skiing for the first time! Most of us don’t succeed on the first try. That’s being human. The key is to continue onward and at some point we WILL succeed. Good luck on your goals. We’ll be rooting for you. Oh tiny spider, always there to help when the world seems crushingly anxious to do us harm. Good luck on your goals this round… I hope the revising and outlining go well! Thanks, Gene! 🙂 Hope you have a great first week of the new year as well. I appreciate the cheering from the toastiness of the fireplace. There is a Magic Trick for skiing, and even more so for jumping once you are good at skiing. Same with jumping. I have amazed myself with some of the air I could get by knowing for sure I was going to land and stay up. One time I even got probably 10 ft or so and landed… And when I did, one of my skis popped off, and I still stayed up on one ski. Mind over matter. I discovered this by accident. 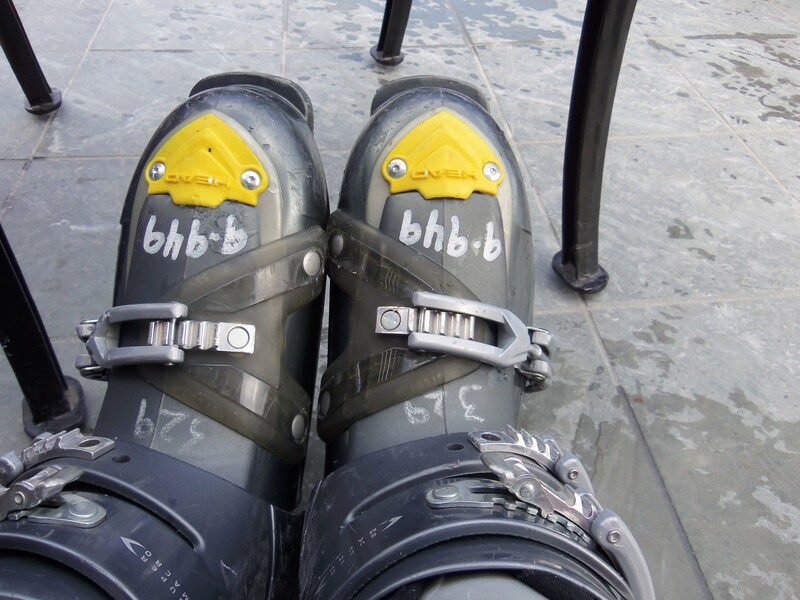 PS – I am jealous, I haven’t been skiing in about 5 or 6 years and I miss it!! Thank you so much for dropping by and giving me some great advice. I tell myself, if I don’t fall down while skiing, I’m not really pushing myself to learn and try new things. That’s what I tell myself. It works most of the time. The other times I’m cleaning snow out of my cuffs and vowing this will be the last run before I find a hot drink. Good luck with your goals. Ha! Love it Barb… I never looked at it like that. You’re right. Falling down is a part of learning. Thank you so much for stopping by. I am smiling about the spider. My 7yo (who wants to ski, not cross-country like I’ve talked up, but downhill, so she can pretend she’s flying, because, as the girl will tell you, “It’s OK – I’m a daredevil!”) loves” arachnids”. Especially venomous ones. Sometimes, there is a huge rubber black widow upside down outside my bedroom door. Funny thing – real spiders scare her. And they fascinate her. She cries, but won’t stop looking. She wants us to move them, but not endanger her lives. At the National Zoo, when she was 5, she fell in love with tarantulas and orb-weavers (and cheated on them just a bit with a scorpion, some Madagascar hissing cockroaches, and a very friendly crab – but, hey, she’s seven!). May your fascination with the idea of skiing outweigh your fears of skiiing. May you face your goals and dreams always with the desire to come back, and try just a little more……. I hope her wild spirit continues as she grows. Orb Weavers are so beautiful and their webs are so grand. I’m sorry you ended your skiing day feeling sad, but the story you told of the day is great. I could really feel how you were feeling. I’m looking forward to hearing about the next excursion. The goals sound great–good luck! be kinder on yourself – nothing wrong with an hour on skies – I’d be grateful even to stand up on them – everyone is a beginner sometime and fear is a well tuned mind protecting you – nothing wrong there self preservation should be a strong instinct – so yay for your brain. Happy New Year and good luck with your goals! Yay for you! You got your first lessons done and behind you. Onward and upward! Oh…uh, I guess that would be downward when you’re skiing. 🙂 Anyway, great choices of goals. You will succeed! Btw, i hate spiders, so please keep him up there on the slopes and away from me. Thanks. Hey Marcia. 🙂 Thanks so much for the encouragement. Don’t worry about the spiders.. I try my best to keep them from people who dislike them. Hey Sonia. 🙂 Thanks so much for your encouragement and for stopping by and commenting. Good for you! I took my kids to see “We bought a zoo” and there was a great line about how all you need is twenty seconds of insane courage to achieve your goals. Thanks for the inspiring post. Twenty seconds of insane courage.. hmm. I like that. What is it about 7-year olds? They’re so intimidating. You remind me of my first and only time skiing. I was a teenager and I never actually skied because I couldn’t figure out how to use the rope tow. It kept flipping me onto my back and yes, others found that amusing. I even bet there were children around 7 snickering. Too bad I couldn’t accidentally crash into them…hee, hee.